Hey hey, it’s the Snoutfit of the Day! There’s some good news with this one. The featured Snort Monster tee is on CRAZY SALE for $8! This was our VERY FIRST litter when we launched in 2013, and there are literally 2 left. Printed on the softest tri-blend fabric ever (or, so we’ve heard from our customers :D), this tee is a must-have. But only if you’re a fan of being both cozy AND stylin’. No big deal. ARIEL! We love you, girl, but you gotta move, so our Snortastic readers can see this week’s #SOTD! After we gently shooed Ariel away, you might’ve noticed that we switched up the shoes. We thought it would be cooooooool to feature the IT color of the moment: Mint. We also liked how it brought out the mint colors in the scarf. We’re not in cahoots with the other brands mentioned. We’re just taking a look at what we have in our closet and piecing together Snoutfit ideas to share with you in hopes that you’ll be inspired to try new Snoutfits with us and to share your own. If you have your own Snoutfit ideas, we wanna hear from you! 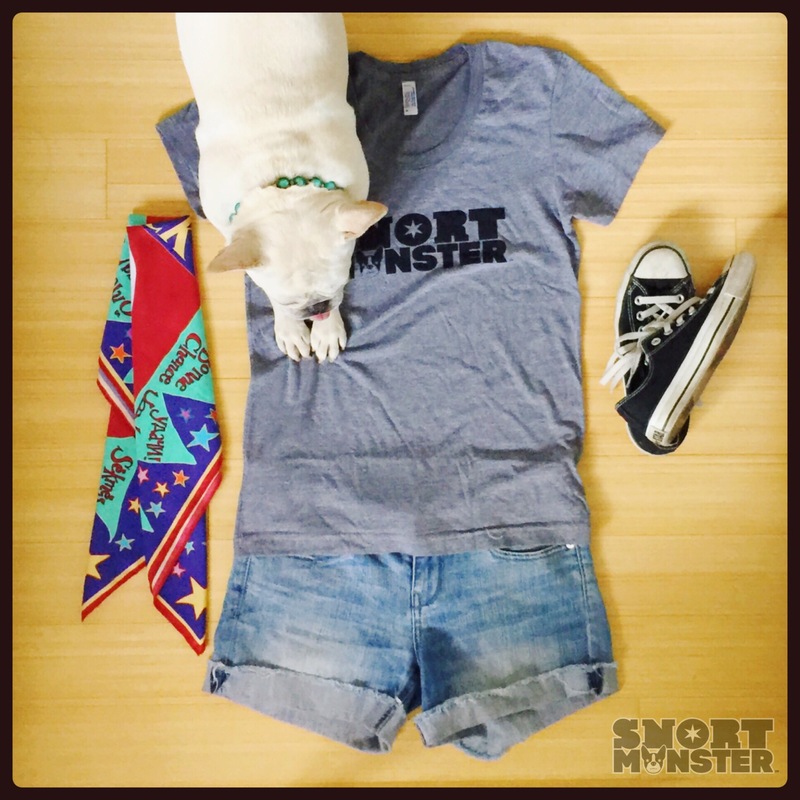 Post your photos on Instagram and tag @snortmonster and #SMsnoutfitoftheday for a chance to win any tee of your choice! Winners will be selected at random on a monthly basis. Submissions must be new and must contain at least one (1) Snort Monster item. Thanks for reading, and SNORT ON! Y’all are right…..this original Snort gear is the softest shirt I have ever worn!!!! Get’em while you can. You can never have to much Snort gear.